Organisers of Sunday’s anti-Occupy Central march will assign retired detectives to look into reports that some participants were paid to show up, after one participating group acknowledged it had offered money to marchers. HONG KONG—When Hong Kong citizens began protesting for democracy and the right to choose their own leader without the Chinese regime’s influence, the Chinese regime protested right back. More than 1,000 pro-Beijing business, labor, political, and community groups organized a march through Hong Kong on Aug. 17 to protest against Occupy Central with Love and Peace, a Hong Kong movement for universal suffrage. The organizers, who call themselves the Alliance for Peace and Democracy, announced after the march that over 1,500 pro-Chinese Communist Party (CCP) groups participated with a total of 193 thousand people. 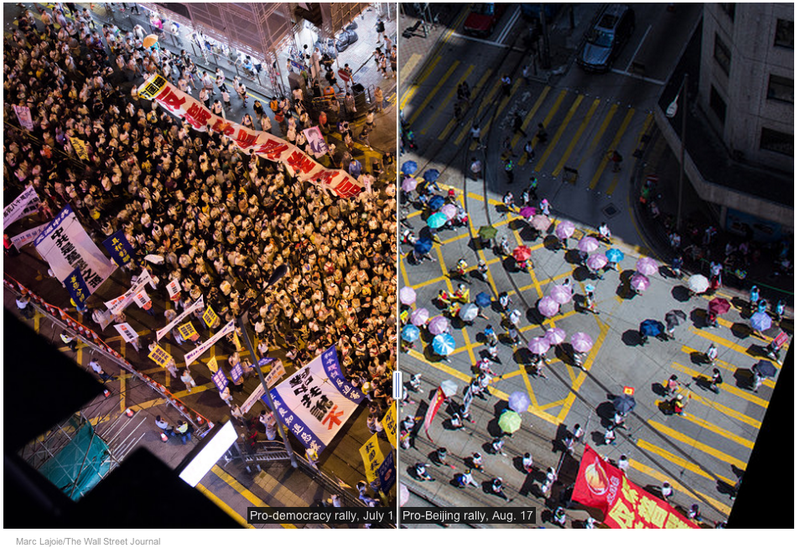 Were some Hong Kong marchers paid? Boisterous demonstrations are a feature of life in Hong Kong, a semi-autonomous Chinese city that enjoys the freedom of speech and assembly. Citizens tend to be extremely politically savvy, as well as practical. Hong Kong’s Future Will Be In The Hands Of Activists Or Politicians? The Hong Kong system of “government” is far from ideal, but the amount of noise it is currently generating locally is out of proportion to Hong Kong’s self-perceived importance on the world stage. Sunday, Hong Kong pro-Beijing camp mobilized a movement to oppose the ‘Occupy Central’. It is said the CCP had invested hundreds of millions of dollars to recruit participants, with money, gifts, free meals and transportation. While the participants were holding banners that stated, ‘anti-violence’, violence was created along the demonstration with trash everywhere. 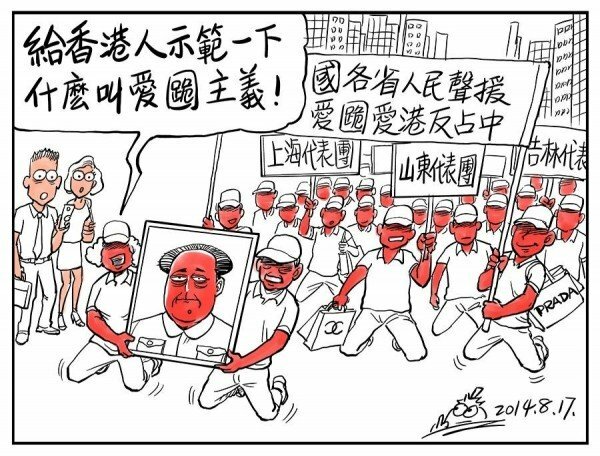 Mainlanders ridicule the clumsy political performance of the CCP as simply a farce. Robert Chow Yung, the spokesman for the Alliance for Peace and Democracy, should apologize to the public over the issue of payments to participants to join the anti-Occupy Central demonstration as reported by the media. If the reports are true, such a practice is a blow to the Hong Kong core value of honesty and can only stir public discontent toward the pro-Beijing campaign. A pro-Beijing rally was held Sunday in Hong Kong to counter the city’s July 1 pro-democracy rally. Local police estimated that 110,600 people attended the pro-Beijing rally at its peak, compared with 66,000 for the pro-democracy rally. But University of Hong Kong researchers came to the opposite conclusion, estimating an attendance of between 79,000 and 88,000 on Sunday, and between 154,000 and 172,000 on July 1. Two days ago a group calling itself the Alliance for Peace and Democracy staged a march in Hong Kong against Occupy Central with Love and Peace, which has threatened to occupy the streets of Central as an act of civil disobedience if the Hong Kong government does not propose to Beijing a model of democratic reform that meets “international standards” and is representative of the views of the Hong Kong people as decided by a referendum. That’s why rallies tend to take place on Sundays and public holidays, when most people have time off. Participants in the mass protest organized by the Alliance for Peace and Democracy on Sunday were given cash and other gifts amounting to HK$200 to HK$350 (US$25.80-45.15) each for taking part in the demonstration against the Occupy Central movement, according to reports by several local newspapers and television stations. The reporters said members of the Federation of HK Guangxi Community Organization offered participants HK$200 each upon showing up at the march, as well as a gift pack of food items worth around HK$130, Apple Daily reported on Monday, citing undercover reporters who joined the march. Many elderly people joined the anti-Occupy Central rally on Sunday and some of them did not know what they were protesting against. The Alliance for Peace and Democracy, which organized the march, claimed that 193,000 people took part in the march. Some seniors said they just came along on the march when asked by leaders of their associations, AM 730 reported. The aftermath of a mass gathering is not always pretty, be it the Woodstock festival or annual July 1 pro-democracy march in Hong Kong. To some extent, disorder and litter are inevitable. So after the march in Hong Kong on Sunday to register opposition to the pro-democracy movement called Occupy Central with Love and Peace, what attracted the most attention was not the images of trash-strewn streets, but of the messy exchange of money for the apparent drudgery of participating in the march. Tens of thousands of Hong Kong residents marched yesterday to show their opposition to a pro-democracy movement threatening to bring the city’s financial district to a standstill if genuine elections aren’t allowed in the semi-autonomous Chinese territory. The demonstration is evidence, organizers and lawmakers said, that Hong Kong’s silent majority has finally spoken up. Or have they? Indeed, plenty of local Hong Kongers (paywall) are concerned by the disruptions an occupation of the city’s financial district could bring and doubt the use of widespread pro-democracy protests, promoted by a group called Occupy Central, in the face of Beijing’s growing influence. But those concerned citizens weren’t necessarily the ones out on the streets this weekend. Democracy activists in Hong Kong on Monday accused police in the former British colony of inflating the number of participants at a weekend demonstration opposing plans for an “Occupy Central” movement, which has threatened mass civil disobedience if China doesn’t offer the city a real choice in the next election for its leader. Police said the number of protesters at Sunday’s pro-Beijing march for “peace and democracy” had reached 111,800, in sharp contrast to the University of Hong Kong’s Public Opinion Programme’s estimate of no more than 88,000. Thousands of protesters occupied Central in a rally against the pro-democracyOccupy Central movement yesterday. However, Now TV, Cable TV, TVB, Oriental Daily and the Economic Journal each discovered instances of demonstrators being paid up to HK$480 or offered freebies to attend. Sunday’s pro-government march will be remembered for a lot of things but not for what it hoped to achieve — win over Hong Kong people. Let’s get the latter part out of the way and say it out loud: the march was an utter failure. More than that, it was an embarrassment, the way a bad joke humiliates a comedian. But more remarkably, it will go down as a bizarre show of force.